MINIX (from "mini-Unix") is a Unix-like computer operating system based on a microkernel architecture. MINIX was first released in 1987, with its complete source code made available to universities for study in courses and research. It has been free and open source software since it was re-licensed under the BSD license in April 2000. MINIX 1.5, released in 1991, included support for MicroChannel IBM PS/2 systems and was also ported to the Motorola 68000 and SPARC architectures, supporting the Atari ST, Commodore Amiga, Apple Macintosh and Sun SPARCstation computer platforms. There were also unofficial ports to Intel 386 PC compatibles (in 32-bit protected mode), National Semiconductor NS32532, ARM and INMOS transputer processors. Meiko Scientific used an early version of MINIX as the basis for the MeikOS operating system for its transputer-based Computing Surface parallel computers. 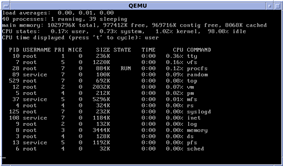 A version of MINIX running as a user process under SunOS and Solaris was also available, a simulator called SMX. Demand for the 68k-based architectures waned, however, and MINIX 2.0, released in 1997, was only available for the x86 and Solaris-hosted SPARC architectures. It was the subject of the second edition of Tanenbaum's textbook, co-written with Albert Woodhull and was distributed on a CD-ROM included with the book. MINIX 2.0 added POSIX.1 compliance, support for 386 and later processors in 32-bit mode and replaced the Amoeba network protocols included in MINIX 1.5 with a TCP/IP stack. Unofficial ports of MINIX 2.0.2 to the 68020-based ISICAD Prisma 700 workstation and the Hitachi SH3-based HP Jornada 680/690 PDA were also developed. MINIX 3 was publicly announced on 24 October 2005 by Andrew Tanenbaum during his keynote speech on top of the ACM Symposium Operating Systems Principles conference. Although it still serves as an example for the new edition of Tanenbaum and Woodhull's textbook, it is comprehensively redesigned to be "usable as a serious system on resource-limited and embedded computers and for applications requiring high reliability." MINIX 3 currently supports only IA-32 architecture PC compatible systems. It is available in a Live CD format that allows it to be used on a computer without installing it on the hard drive, and in versions compatible with hardware emulation/virtualization systems, including Bochs, QEMU, VMware Workstation/Fusion, VirtualBox and Microsoft Virtual PC. Version 3.1.5 was released 5 November 2009. It contains OpenOffice.org are not yet available for MINIX 3 however. As of version 3.2.0, the userland was mostly replaced by that of NetBSD and support from pkgsrc became possible, increasing the available software applications that MINIX can use. Clang replaced the previous compiler (with GCC optionally supported), and GDB, the GNU debugger, was ported. The design principles Tanenbaum applied to MINIX greatly influenced the design decisions Linus Torvalds applied in the creation of the Linux kernel. Torvalds used and appreciated MINIX, but his design deviated from the MINIX architecture in significant ways, most notably by employing a monolithic kernel instead of a microkernel. This was famously disapproved of by Tanenbaum in the Tanenbaum–Torvalds debate. Tanenbaum explained again his rationale for using a microkernel in May 2006. In May 2004, Kenneth Brown of the Alexis de Tocqueville Institution made the accusation that major parts of the Linux kernel had been copied from the MINIX codebase, in a book called Samizdat. These accusations were rebutted universally—most prominently by Andrew Tanenbaum himself, who strongly criticised Kenneth Brown and published a long rebuttal on his own personal Web site, also pointing out that Brown was funded by Microsoft. At the time of its original development, the license for MINIX was considered to be rather liberal. Its licensing fee was very small ($69) compared to those of other operating systems. Although Tanenbaum wished for MINIX to be as accessible as possible to students, his publisher was not prepared to offer material (such as the source code) that could be copied freely, so a restrictive license requiring a nominal fee (included in the price of Tanenbaum's book) was applied as a compromise. This prevented the use of MINIX as the basis for a freely distributed software system. When free and open source Unix-like operating systems such as Linux and 386BSD became available in the early 1990s, many volunteer software developers abandoned MINIX in favor of these. In April 2000, MINIX became free/open source software under a permissive free software license, but by this time other operating systems had surpassed its capabilities, and it remained primarily an operating system for students and hobbyists. 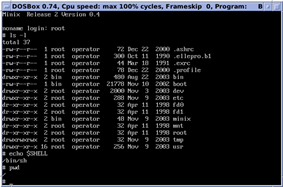 ^ Flouris, M. "Installing and running MINIX for Solaris (SMX)". Retrieved August 2, 2011. ^ Harvey, George. "Minix on the Prisma". Retrieved August 2, 2011. ^ "MINIX for Jornada". Sep 23, 2002. Archived from the original on December 11, 2002. Retrieved August 2, 2011. ^ Herder, J. N.; Bos, H.; Gras, B.; Homburg, P.; Tanenbaum, A. S. (2006). "Minix 3". ACM SIGOPS Operating Systems Review 40 (3): 80. ^ Schmidt, Ulrich (November 10, 2010). "New to minix". Retrieved August 2, 2011. ^ "MINIX Releases". wiki.minix3.org. Retrieved 29 February 2012.